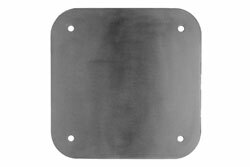 5.5 inch square plate for permanent or magnetic mounting of permanent mount or magnetic mount Golight remote controlled spotlights or Larson Electronics magnetic spotlights. Also, this plate can be mounted to any non-ferrous (fiberglass, etc.) 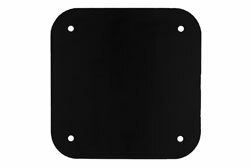 surface so that lights with magnetic bases can be attached to this mounting plate. Plate has 4 mounting holes for 4 self tapping fiberglass screws.